The latest edition of The Moth and Me, #12, is up over at The Skeptical Moth. Chris has done a great job compiling the varied posts, in the process reflecting on his own “mothing journey”. You should, at the very least, head over to check out this month’s TMaM – but while you’re there, spend some time browsing some of Chris’s other excellent content, too! TMaM heads to Today in NJ Birding History for edition #13 – and despite convention, I consider 13 to be a lucky number, so make sure you remember to participate in what will surely be an outstanding edition! Send your submission to Jennifer (ammodramus88 AT gmail.com) or to myself (canadianowlet AT gmail.com) by July 13. We’re looking for hosts for August and beyond! It’s easy and fun, and only takes an hour or two (or several, if you’re the type to go crazy with it…). If you’re interested in hosting, send me an email indicating what month you’d like to sign up for. The latest edition of The Moth and Me, the blog carnival dedicated to our favourite club-less lepidopterans, has been posted at my other blog, The Marvelous in Nature. The next The Moth and Me will be hosted by Ted at Beetles in the Bush – send him your posts by May 13th for inclusion in the next edition! We have a host lined up for July, but June and August through November are still awaiting hosts. If you think this sounds like fun (and it is! ), drop me a note at canadianowlet [at] gmail [dot] com to sign up or find out more. It’s been three long, empty months, but just as our moths are beginning to return to our porch lights here in the northern hemisphere, so too does The Moth and Me make a return to the blogosphere. The Moth and Me #9 is now up at Xenogere. 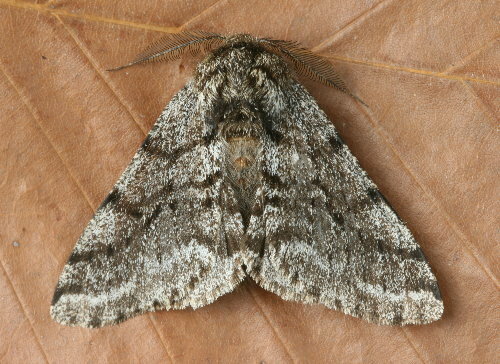 Jason shares with us an encounter and conversation with a female Woolly Gray, Lycia ypsilon – a species of moth where the females lack functional wings. Into his story he weaves all of this month’s great contributions. Make sure you pop over to check it out! Not a Woolly Gray, but related. This is my local species of Lycia: a Stout Spanworm, Lycia ursaria. Looks similar. This one's a male. They'll be on the wing soon. This month’s edition is the final one of 2009, and was hosted by Susannah of Wanderin’ Weeta. Check out the excellent assortment of moth-related blog posts that she’s assembled to give us another reason to be glad the earth is not flat. The Moth and Me will return in March 2010, when it will be hosted by Jason of Xenogere. Send your submissions to jason AT xenogere D0T com by March 13th. We’re looking for hosts for April 2010 and beyond. If you’re interested in hosting, send me a note at sanderling AT symbiotic D0T ca. The Moth and Me #7 is now up at Reflections on the Catawba. Lori runs a Tuesday Night Moth Club in western North Carolina as a regular event for the nature park where she works. She’s relatively new both to moths and to blog carnivals, so let’s all pop over and make her feel welcome! While you’re there, check out some of the links she’s posted on how to get started in mothing, see some of her latest catch, and check out all the other goodies submitted to her or that she’s collected from around the web. The November edition, #8, will be hosted by Susannah over at Wanderin’ Weeta. Even though here in the northern hemisphere our snow-less season is drawing to a close, there’s still some last few moths to be caught on the warmest nights. Folks further south of the border might yet find things on the wing for a couple of months. Blog about what you find and send your links to Susannah (wanderinweeta AT gmail D0T com) or myself (sanderling AT symbiotic D0T ca) by November 13. The Moth and Me will be on hiatus for the northern hemisphere winter, December through February. We’re looking for hosts for March 2010 and beyond next year. If you think you might be interested, drop me a note with the month you’d like and I’ll pencil you in. The September edition of The Moth and Me, #6, is now posted at my main blog, The Marvelous in Nature. Pop over to check it out! The October edition, #7, will be hosted by Lori at Reflections on the Catawba. Send me (sanderling [at] symbiotic [dot] ca) or Lori (loriowenby [at] gmail [dot] com) your submissions by October 13th. We’re looking for hosts for March and beyond. If you think you’d be interested, drop me a line at sanderling [at] symbiotic [dot] ca. It has been a hectic summer. Between the move (both packing up and getting settled) and a few other personal happenings the months have just flown by. Some things have fallen by the wayside as a result. This blog has been one of them, and The Moth and Me likewise was put on the backburner. I had received no submissions, and lacking the time to actively go out to round up links myself, I’d decided not to worry about getting it done. New blogger and moth’er Matt Sarver of The Modern Naturalist discovered the blog and was excited about the prospect of a blog carnival for moths. Noting that I had missed the deadline I’d indicated for posting the carnival, he offered to pull it together himself this month. I was pleased and grateful to accept his offer. Matt did a great job with The Moth and Me #5, which he is hosting over at his own blog. Make sure you pop over to check out the August edition. Because I anticipate having less time to devote to this blog, and because I think it might foster more interest in the carnival, I’m sending it roaming. Although initially I’d planned to have each edition hosted here, I think it makes more sense to invite participants to host the different editions, which would hopefully be mutually beneficial in providing exposure to both the carnival and the hosting blog. If you’re interested in being a host, we’d love to have you on board! It’s a fun way to see some new blogs and also learn a bit more about moths. We’re looking for hosts for September (to be posted on or about the 15th), October and November this year, and March next year and beyond. If any of these months appeal to you, send me a note at sanderling [at] symbiotic [dot] ca indicating which month, and providing the name and address of your blog, or leave a comment here.